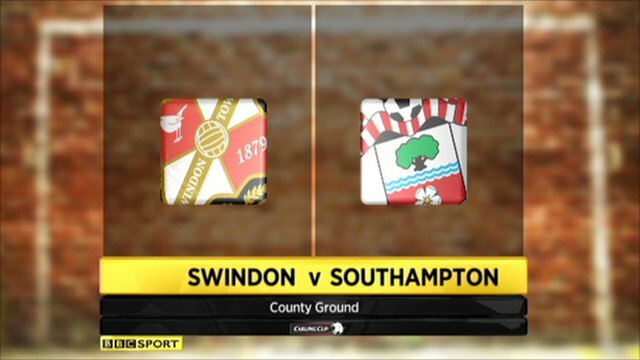 Southampton strolled to victory against Swindon in their Carling Cup second-round tie at the County Ground. Lee Holmes crossed for Guly Do Prado to head Saints ahead before Jonathan Forte made it 2-0 before the interval. Substitute Mehdi Kerrouche curled in a late 25-yard free kick to give the Robins hope, before Leon Clarke missed a good chance to equalise. But Saints substitute Rickie Lambert's cool finish in stoppage time sealed it for the visitors. Star striker Lambert had only come on to replace Forte seven minutes from time. Saints will now host Charlton or Preston in round three. "First half was very good, we totally controlled the game. Second half, maybe we should have been a lot more ruthless with our approach. "We gave them a bit of a run round in the first half, and the second half they obviously had to do something about it, and credit to them for that. "There were lots and lots of good positives to take from tonight and we're going to keep working." 90:00+5:14 The referee ends the match. 90:00+4:35 Substitution Sam Hoskins comes on in place of Guly Do Prado. 90:00+3:35 Assist by Frazer Richardson. 90:00+3:35 GOAL - Richard Lambert:Swindon 1 - 3 Southampton Richard Lambert finds the net with a goal from inside the six-yard box low into the middle of the goal. Swindon 1-3 Southampton. 90:00+2:18 Booking Alan McCormack receives a caution for dissent. 90:00+0:46 Frazer Richardson takes a short corner. 90:00+0:46 Substitution Dean Hammond replaces Lee Holmes. 88:00 Callum Kennedy produces a cross, Leon Clarke takes a shot. Bartosz Bialkowski makes a save. Inswinging corner taken right-footed by Matt Ritchie, Header from close in by Leon Clarke misses to the right of the target. 87:20 Unfair challenge on Alan McCormack by Guly Do Prado results in a free kick. Paul Caddis takes the free kick. 86:04 Dan Harding takes a shot. Blocked by Alberto Comazzi. Inswinging corner taken by Adam Lallana, Alberto Comazzi manages to make a clearance. 84:38 Etienne Esajas produces a left-footed shot from just outside the box that misses to the right of the net. 84:09 Leon Clarke is penalised for a handball. Free kick taken by Bartosz Bialkowski. 83:05 Substitution Richard Lambert on for Jonathan Forte. 83:05 GOAL - Mehdi Kerrouche:Swindon 1 - 2 Southampton Mehdi Kerrouche finds the net with a shot from the free kick from 18 yards. Swindon 1-2 Southampton. 81:19 Frazer Richardson challenges Mehdi Kerrouche unfairly and gives away a free kick. 78:51 The ball is delivered by Guly Do Prado. 74:18 Inswinging corner taken by Adam Lallana from the left by-line. Corner from the right by-line taken by Lee Holmes, clearance made by Callum Kennedy. 72:58 Substitution Alan McCormack replaces Simon Ferry. 71:53 Matt Ritchie takes a shot. Blocked by Morgan Schneiderlin. Simon Ferry takes a inswinging corner from the left by-line to the near post, clearance by Guly Do Prado. 70:20 Free kick awarded for a foul by Matt Ritchie on Adam Lallana. Dan Harding takes the free kick. 69:31 Leon Clarke challenges Aaron Martin unfairly and gives away a free kick. Direct free kick taken by Bartosz Bialkowski. 68:41 Corner taken by Matt Ritchie from the right by-line played to the near post, Bartosz Bialkowski makes a save. Etienne Esajas takes a shot. Blocked by Daniel Seaborne. 68:21 Matt Ritchie sends in a cross, clearance made by Lee Holmes. 67:26 The ball is delivered by Lee Holmes, Paul Caddis makes a clearance. Inswinging corner taken from the left by-line by Jonathan Forte, save by Phil Smith. 66:09 Booking Dan Harding booked. 65:25 Leon Clarke challenges Jack Cork unfairly and gives away a free kick. Frazer Richardson restarts play with the free kick. 62:16 Guly Do Prado gives away a free kick for an unfair challenge on Mehdi Kerrouche. Free kick crossed left-footed by Callum Kennedy from right channel, clearance made by Aden Flint. 61:26 Frazer Richardson takes a shot. Comfortable save by Phil Smith. 61:13 Adam Lallana crosses the ball, Alberto Comazzi makes a clearance. 57:29 Paul Caddis fouled by Adam Lallana, the ref awards a free kick. The free kick is delivered left-footed by Callum Kennedy from right channel, Aaron Martin manages to make a clearance. Inswinging corner taken by Jonathan Smith from the left by-line. 55:16 Shot by Etienne Esajas. Save made by Bartosz Bialkowski. Correction - 53:13 Free kick taken by Phil Smith. Correction - 53:13 Substitution Lander Gabilondo goes off and Etienne Esajas comes on. Correction - 53:13 Unfair challenge on Paul Caddis by Jonathan Forte results in a free kick. 53:13 Phil Smith restarts play with the free kick. 53:13 Substitution (Swindon) makes a substitution, with Etienne Esajas coming on for Lander Gabilondo. 53:13 Jonathan Forte challenges Paul Caddis unfairly and gives away a free kick. 52:34 Guly Do Prado takes the direct free kick. 52:34 Booking Jonathan Smith is booked. 52:05 Jonathan Smith gives away a free kick for an unfair challenge on Dan Harding. 50:25 Unfair challenge on Aaron Martin by Leon Clarke results in a free kick. Direct free kick taken by Aaron Martin. 48:41 Headed effort from deep inside the area by Leon Clarke misses to the right of the target. 47:47 Guly Do Prado gives away a free kick for an unfair challenge on Paul Caddis. Paul Caddis restarts play with the free kick. 47:10 The ball is delivered by Jonathan Smith. 45:00+2:43 The first half comes to an end. 45:00+2:04 Morgan Schneiderlin takes the direct free kick. 45:00+2:04 Booking The referee shows Mehdi Kerrouche a yellow card for dissent. 45:00+1:43 Free kick awarded for an unfair challenge on Jack Cork by Lander Gabilondo. 45:00+1:14 Free kick awarded for an unfair challenge on Jack Cork by Mehdi Kerrouche. Direct free kick taken by Jack Cork. 45:00+0:17 Jonathan Forte gives away a free kick for an unfair challenge on Aden Flint. Direct free kick taken by Phil Smith. 44:06 Headed effort on goal by Jonathan Forte from inside the penalty box misses to the right of the target. 43:00 Free kick awarded for an unfair challenge on Jack Cork by Mehdi Kerrouche. Morgan Schneiderlin takes the direct free kick. 41:36 Free kick awarded for a foul by Guly Do Prado on Jonathan Smith. Direct free kick taken by Jonathan Smith. 39:46 Jack Cork produces a right-footed shot from deep inside the six-yard box which goes wide of the right-hand upright. Free kick awarded for a foul by Simon Ferry on Lee Holmes. Morgan Schneiderlin takes the free kick. 39:00 The ball is sent over by Lee Holmes, Alberto Comazzi makes a clearance. 37:50 Booking Aaron Martin receives a caution for unsporting behaviour. 37:14 Lander Gabilondo sends in a cross. 36:27 Corner taken by Lander Gabilondo from the right by-line to the near post, save by Bartosz Bialkowski. 30:51 Substitution Mehdi Kerrouche replaces Alan Connell. 29:48 Assist on the goal came from Guly Do Prado. 29:48 GOAL - Jonathan Forte:Swindon 0 - 2 Southampton Jonathan Forte gets on the score sheet with a goal from just inside the penalty area to the bottom left corner of the goal. Swindon 0-2 Southampton. 28:13 The ball is delivered by Lee Holmes, Alberto Comazzi manages to make a clearance. 26:57 Shot from just outside the box by Jonathan Forte misses to the right of the goal. 26:15 The ball is delivered by Adam Lallana. 25:15 Alberto Comazzi restarts play with the free kick. 25:15 Booking Booking for Morgan Schneiderlin for unsporting behaviour. 25:07 Unfair challenge on Alan Connell by Morgan Schneiderlin results in a free kick. 23:51 Jonathan Smith crosses the ball, Aaron Martin makes a clearance. Callum Kennedy takes the chance to get an effort at goal and missed to the right of the net. 22:17 Dan Harding produces a cross. 20:11 Lee Holmes fouled by Callum Kennedy, the ref awards a free kick. Lee Holmes fires a strike on goal direct from the free kick, save by Phil Smith. 16:21 Lee Holmes provided the assist for the goal. 16:21 GOAL - Guly Do Prado:Swindon 0 - 1 Southampton Guly Do Prado finds the net with a headed goal from close range. Swindon 0-1 Southampton. 15:09 Lee Holmes takes a inswinging corner from the right by-line to the near post, save by Phil Smith. 11:07 Lee Holmes sends in a cross, Callum Kennedy gets a block in. Corner taken by Lee Holmes from the right by-line played to the near post, Leon Clarke manages to make a clearance. 9:38 Jonathan Forte sends in a cross, Shot from just outside the box by Adam Lallana goes over the crossbar. 7:43 Jonathan Smith gives away a free kick for an unfair challenge on Morgan Schneiderlin. Morgan Schneiderlin restarts play with the free kick. 7:13 Aaron Martin fouled by Alan Connell, the ref awards a free kick. Morgan Schneiderlin takes the direct free kick. 5:51 Callum Kennedy sends in a cross. 5:02 Lee Holmes decides to take a short corner. 3:55 Alan Connell is caught offside. Bartosz Bialkowski restarts play with the free kick. 1:31 Leon Clarke is caught offside. Indirect free kick taken by Bartosz Bialkowski. 0:50 The ball is crossed by Paul Caddis, clearance made by Frazer Richardson.